It’s that time of year when marketers take a look back at the performance of their marketing activity. What made the grade, and what was bottom of the class and should be banished from your marketing toolbox, never to return? Hopefully, you’ll already have a core plan for the coming year, but to hit your (inevitably) increasing targets you’ll either need to make existing channels work harder or implement new activity. So how can you convince the holder of the purse strings to give you the budget to launch a new marketing channel? There are very few channels where you can guarantee the CPA you’ll pay for each new sale, while maintaining volume. Tried and tested channels like PPC (which is likely to form a significant part of a marketing plan) have generally become more expensive in recent years, as the cost per click has increased rapidly. And while you can now work towards a max CPA with Adwords, CPA bids can really drive down the volume of traffic. A good referral platform can deliver a steady stream of new customers, at a cost you can build into your marketing plan. Fewer nasty surprises for your bottom line. Never has trust been so important in marketing. In the era of fake news, the Edelman 2017 Trust Barometer shows consumers trust in businesses and media is at an all-time low. So who do we turn to when considering a purchase? Nielsen report that83% of us turn to friends and family for recommendations, well above any other media source. 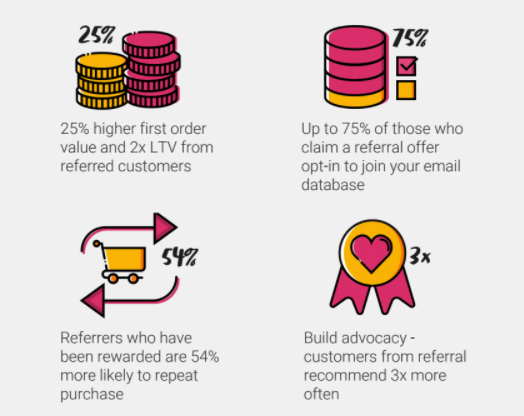 As such, capturing this advocacy via a referral program seems an obvious solution - but can you be sure that these referred customers are as good quality as your existing customer base? Might offering a referral reward only attract discount hunters who take your offer only never to return? You might be surprised to learn the opposite is true - referred customers are generally more valuable than your existing customers. In an era of heavy discounting and Black Friday flash sales, it’s a relief to know that there's a channel which can actually increase LTV. When you find a media option that works, you really want to scale it up, while maintaining control over CPA. With paid search, you’ll want to work on the long-tail keywords to drive those incremental orders at a lower cost. Traffic is limited on these long-tail keywords, but the flipside to this is that whilst high volume keywords will drive more traffic, they will attract a much higher CPC, meaning your cost per conversion will increase. Optimizing your website and implementing an SEO strategy can certainly drive more traffic, but sadly this isn’t something that can be delivered overnight. Referral is different. It can be scaled up whilst maintaining exactly the same CPA.